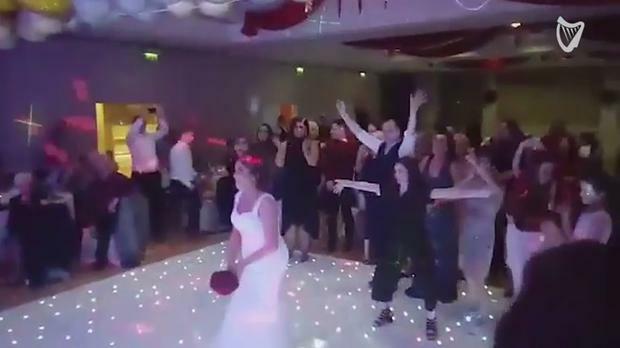 There was very nearly murder on the dancefloor at a wedding in Dublin over the festive season, as eager guests vied to be crowned next in line to say 'I do' by coming out victorious in a bouquet toss. Amanda Doyle and James Hall from Ballyfermot tied the knot on New Year's Eve and were enjoying their celebrations in in the Green Isle Hotel before the bride opted to take to the floor to toss the bouquet. The traditional toss started out calmly enough, with guests lining out hoping to get lucky with a decent - and fair - catch. However things turned a rather ferocious as two determined guests - presumably hoping to get 'catch a bouquet' ticked of their new year's resolutions list nice and early - decided they weren't leaving without a handful of flowers. It was all in good fun of course, with good friends Marc O'Reilly and maid of honour Suzanne Doyle (the bride's sister) scrambling for the coveted prize in the end, leaving guests and remaining competitors (and much of the prized bouquet) on the floor laughing at the scuffle. THEVOW.ie A Cork man took his love to new heights when he pulled off a sweet festive proposal in an airport arrivals hall. Karen Birney, THEVOW.ie Olivia and Daniel first met twelve years ago when they were introduced by mutual friends. Karen Birney, THEVOW.ie When it comes to weddings, most of the time it's better to just 'go with the flow' than to try to have everything down to a T - or as one wise Galway bride says 'whatever will happen, will happen'. Handkerchiefs at the ready, because this one will bring tear to your eye!